Wow! I LOVE my new home. I can’t imagine me thinking it would be so boring and lonely. Now, it feels like I’ve known it like the back of my hand! It’s so bright and cheery, and we even stayed up later than we should’ve and had a PARTY! 😉 Pictures are coming up now! If you haven’t figured out already, I’M PRETTY EXCITED. Look at our fabulous new ROOM! Here you see the Our Generation Salon Chair, a brush, spitzer, AG Sparkly Hair pick, and our homemade closet with out shoes on top of it in a box. 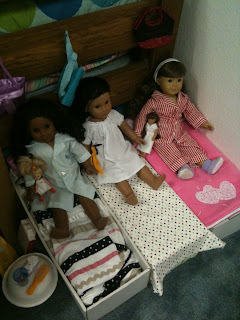 Here are our beds! And our little side table (featuring the Our Generation doll-sized brush, a doll-sized cup containing spare hair elastics, and a doll-sized tissue box!) Above us are nails, and hanging on them our some bags! 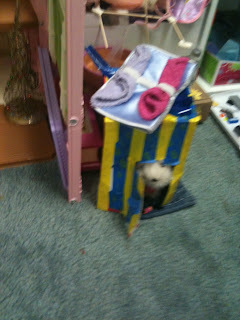 And Molly-Anne’s LUXURY home! The reason she’s not in it is because we’re having a “New Home” party and we’re playing with our dolls, listening to music and dancing our hearts out. Here’s where Coconut stays! Mom’s BFF’s made this for her out of a Happy Meal box. Who would’ve thought that you could make an AG pet house out of a McDonalds Happy Meal box? WOW! Having the party of our lives! (here’s a picture we took earlier in the day, that’s why it’s brighter and I’m not in my PJ’s.) 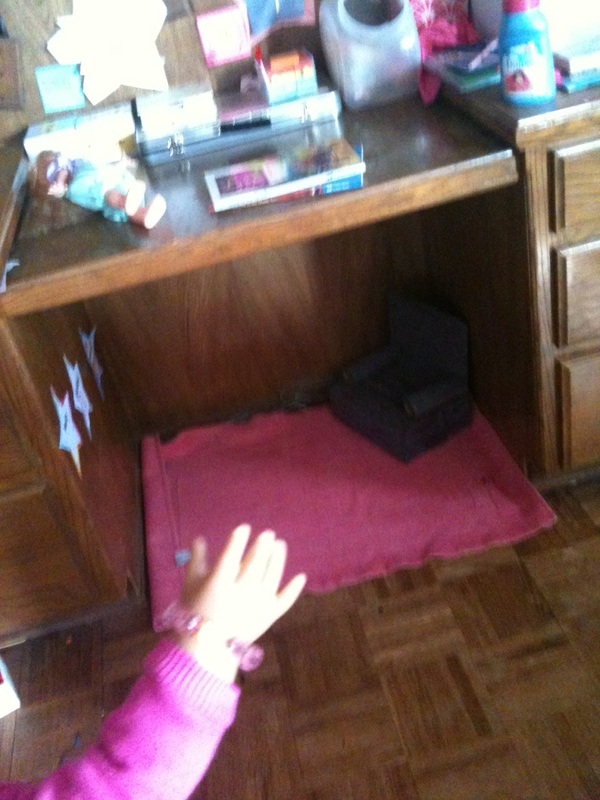 This is underneath mom’s desk NOW! It’s all empty, except with one chair in the side in case one of us wants to visit mom while she’s crafting at her desk. I LOVE our new home!! I couldn’t imagine a better place for Josefina to spend her birthday. I love our new home, although I’ve said that probably hundreds of times– HURRAY! 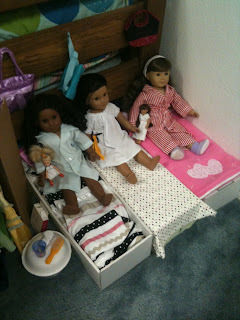 Where do your doll(s) live? Thats so AwESOME!! !i am so glad you like your new home! it looks so bright and cheery and fun! 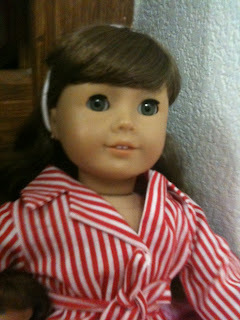 My doll Emily Moved yesterday to! she used to sleeep under my desk chair, now she sleeps on my bed! her bed is a pillow case for the sheets and then a small pillow for her pillow and a doll quilt i got for for Christmas and she has a little ledge for her stuff! I hope you dolls LOVE your new home! i looks great! Here’s Emily: Hi girls! i hope you enjoy your new home! i am enjoying my new bed area! my dressing area is still by Hannah’s desk where i keep my closet and on the other side of Hannah’s desk is my horse’s stable! 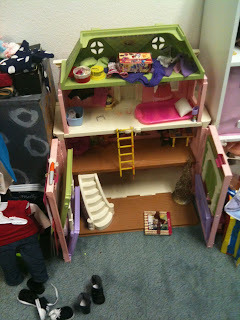 it looks like an awesome epic home you girls have! Elizabeth: I’m glad you like your new room!!! You should go see our (and mama’s) newest blog post!!!! So, Madison: They’re in your room now, right? I bet you’re happy to have them with you so you can play with them whenever you want! I’m so glad you like your new room! You thought you would hate it, but you love it better thn your old one! I’m so glad! It’s cute! Marie-Grace: do you like your room Cecile? I love my room! 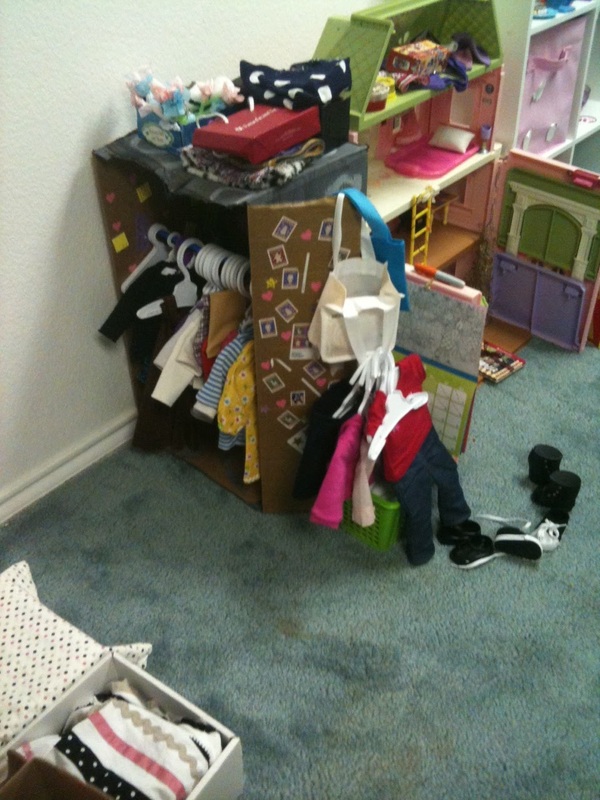 It has a bunk bed, (I’m at the top, of course), table and chairs, a little bench that has our charms and books, and under moms bed holds doll clothing and accessories in Emma’s box. We’re right next to moms bed. The reason we have the charms on the bench is because Emma lost her necklace so when we get a MAG we will put the charms we have on her necklace. (This is for your mom and sisters too). That’s the only place we have for our room, so if we get another sister, I wonder where she’ll sleep? We will find out when we get one. Well I’m going to go now. Au revoir! 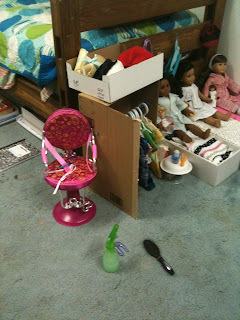 Cecile: I LOVE my new room!! And wowee, it sounds like you have an awesome room, too! We sleep above humans head 😛 it’s pretty comfortable, but human said that I’m going to sleep with Saige when she gets her. BREAKING NEWS! 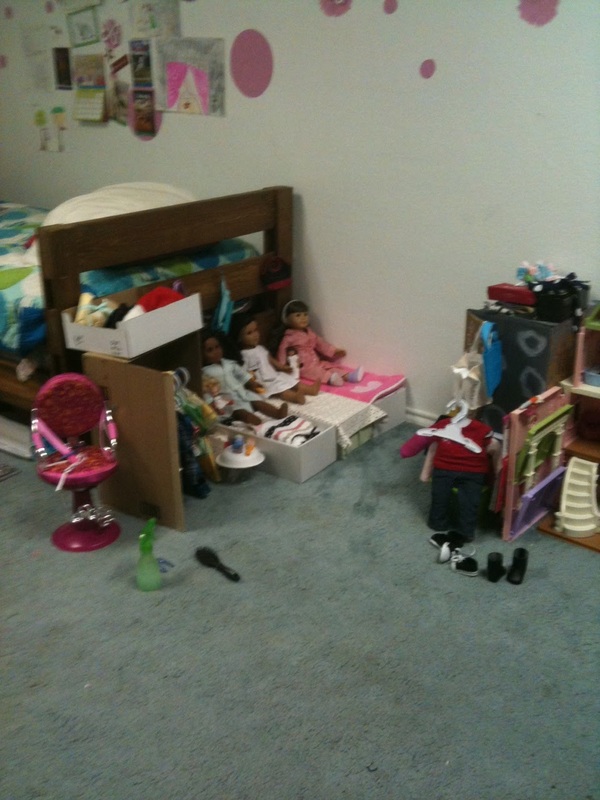 : last night Emma went to the doll hospital at the dallas AGP! She will be here in 2-3 weeks! Marie-Grace: Its true! We had a last minute decision, to send her last night! OH NO!! Poor Emma, I bet she’s scared. 🙁 Why did she need to go to the doll hospital? We needed to send her to get a new head. Her eye is broken and her face is kinda scratched up! We hope she isn’t TOO scared! BAD NEWS: SHE IS GOING TO MISS HER BIRTHDAY POSSIBLY!!!!!!!!! If its 3 weeks, she might not but if 4 weeks, we won’t be here! My dad will, but we will be in Canada for my aunts wedding, my dad MIGHT be able to bring her when he flys up, but were driving! So I don’t know, but I guess we’d just have to live with it.